They elected him. Now can he deliver? Steven Whitt fires up the coffee pot and flips on the fluorescent sign in the window of the Frosty Freeze, his diner that looks and sounds and smells about the same as it did when it opened a half-century ago. Coffee is 50 cents a cup, refills 25 cents. The pot sits on the counter, and payment is based on the honor system. ROWLAND, N.C. (AP) — They put down their pompoms and lined up along the football field behind their tiny high school in their tiny town. Their classmates marched the American flag onto the field. "The Star-Spangled Banner" began, and six teenage girls with blue bows in their hair each dropped to one knee. PORT ARTHUR, Texas (AP) — The church was empty, except for the piano too heavy for one man to move. It had been 21 days since the greatest storm Wayne Christopher had ever seen dumped a year's worth of rain on his town, drowning this church where he was baptized, met his high school sweetheart and later married her. When the people of Jefferson County, Texas, narrowly voted majority Trump last November, climate change rarely came up as an issue. Then they were devastated by Hurricane Harvey. AP Video by Martha Irvine. "I don't want this life"
It’s the “Appalachia of the Pacific Northwest,” a place known for poverty, drugs and death. Grays Harbor County, Washington, also voted majority Trump. Can his renewed “War on Drugs” help save it? AP Video by Martha Irvine. Forrest Wood talks about the roots of his addiction. Staci Hadley talks about her addiction and her hope. Androscoggin County, Maine, hadn’t voted majority Republican for president since the Reagan era, until November. Now the county, which has seen a big influx of African refugees, is part of Trump Country. 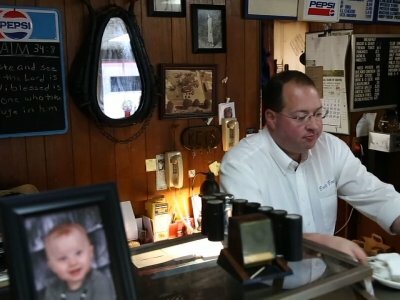 "They just seemed to take over"
“I’m hoping that our country starts to be run like a business"
This is Trump country, a remote chunk of the upper Midwest where people are ready to see what the new president can do for them. Here, AP's Martha Irvine explores the issues that concern them most -- namely, jobs, gun rights and what many farmers see as dismal market prices for their crops and livestock. AP journalists speak about how the "Trump Country" series came together.